Fundamental analysis is considered to be the cornerstone of investing. Fundamental analysis involves studying revenues, expenses, liabilities etc in order to gain knowledge of the health of a company. It also involves analyzing underlying sectors, trends etc. The goal with fundamental analysis is to derive a forecast and hopefully profit from future price movements of the company’s stock. The fundamental approach is trying to determine what is cheap or expensive at the moment and by studying the financial health of the company the fundamental analyst tries to determine if the value of the company will increase or decrease in future. While technical analysis studies the actual price movements, fundamental analysis focuses on the company itself and doesn’t care about short term fluctuations of the stock price. Banks and full brokerage houses have fundamental analysts employed that analyse companies. They use proprietary developed models in order to decide whether a company is cheap or expensive. These analysts also follow news regarding sector trends and company news in order to determine if this affects the company. They meet the management of the companies, suppliers, competitors etc. The typical fundamental analyst spends time analyzing the company and then sells this product to institutional clients that pay the broker house by commission. A significant part of the business for the broker house is also derived from when a certain company goes public and work is done by the corporate finance department. A highly ranked analyst in a specific sector at a broker house is often seen as good PR to get to list an IPO for example. Generally speaking fundamental analysts are per default bullish and one should be aware of the interest between fundamental research pushed to clients and corporate finance related business the broker house conducts. Although most analysts are bullish their views often vary according to their models and subjectivity. Some researchers see potential in aspects of a company that few even have thought about, while others see threats that no one is thinking about at the moment. How do you put a value on this? How do you properly understand the value of a company? One can argue that fundamental analysis is not for the active trader but that is not entirely true. Surely, the fundamental approach is for the long term investor, but even shorter term traders need to know basic fundamentals. Depending on the trading time frame the shorter term trader needs to interpret fundamental news about a company or how sector specific news might affect a certain stock. For example earnings or news from Caterpillar will most probably affect a similar company in Europe. This is fundamental news that will affect even the short term trader. Companies report quarterly earnings and this is usually the most hectic time for the fundamental investors. After every earnings report companies hold conference calls where interesting and price affecting information may be revealed. Irrespective if you are a short term trader or longer term investor, such information will affects the share price and will provide both trading and investing opportunities. There are a number of financial ratios the fundamental investor looks at. Some are listed below. Do bear in mind that different sectors have different ratios (for example growth companies are characterized by other aspects than more mature companies), hence a simple comparison between two p/e ratios of two different companies won’t say much at all. EPS, earnings per share, shows the value of earnings per outstanding share of the company. P/E ratio measures the ratio of the company’s stock price in relation to the company’s earnings per share. It is a widely used ratio to value a company. Generally speaking, higher growth firms have higher P/E ratios. A dividend is a part distribution of a company’s earnings paid to the existing shareholders (registered at the time of the dividend). The payment itself is mostly a cash payment, but it can be stocks or other forms of payment. The dividend yield is the dividend ratio divided by the price per share. Normally, only financially sound companies pay out dividends. A company that pays out a high dividend yield is often seen as the company being steady and shareholder friendly. Price-sales ratio (P/S) measures the market cap of the company in relation to the sales over the past 12 months. Generally, the lower the ratio the more attractive the investment. Price to book ratio (P/B) measures the company’s current market cap in relation to the book value (assets minus liabilities, ie shareholder equity). Return on equity (ROE) measures the amount of net income returned as a percentage of equity. It is a measure of a corporation’s profitability by showing how much profit a company generates with the money shareholders have invested. The income statement reports total income minus all costs and shows ultimately if the business is making a profit or a loss. Costs are divided into various subgroups. Revenue, also called “top line”, is composed of all the sales, royalties, fees etc the company makes. Healthy revenue is key for any business. Some investors go into deeper analysis of sales, accrued and deferred revenues which are basically classifying revenues. Depending on the type of revenue it might be accounted as a liability or asset on the balance sheet. In order to make your revenues a firm will have expenses. These are divided into costs of goods sold (labour, materials etc) and operating expenses which is basically other costs that the business will have but are not part of the productions costs. 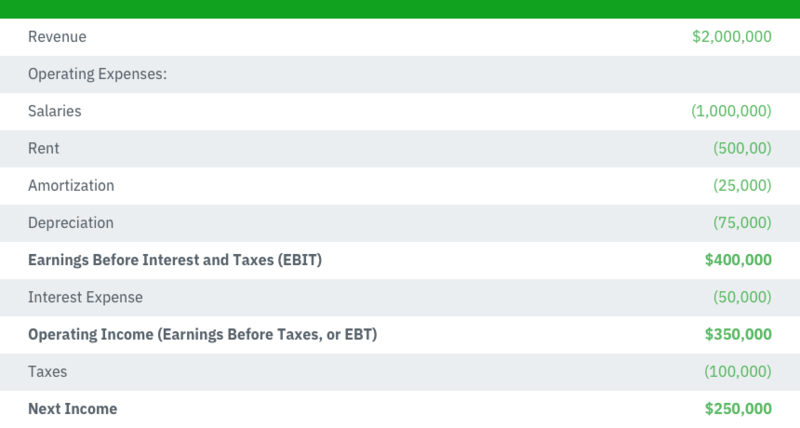 Anybody with even a remote interest in finance or trading will hear about the famous EBITDA, earnings before interest, tax, depreciation and amortization, which measures a company’s operating performance. 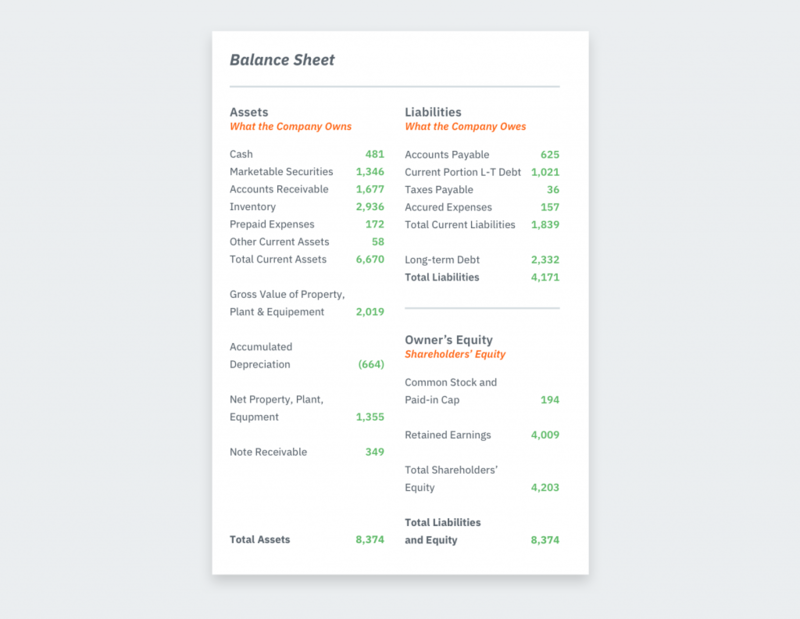 The Balance sheet is composed of the company’s assets, liabilities and shareholder equity at a given time. It basically gives the investor a quick look at what the company owns, owes as well as what shareholders have invested. Assets are tangible items such as property, cash, inventory etc. Bear in mind assets are valued to certain valuations but in order to dispose of those assets liquidity can be an issue. A financial trading company can have big assets in form of small cap stocks. These have to be marked in the statements, but are probably not easy to liquidate at marked valuations. Liabilities are various forms of debt the company holds: mortgages, loans, money owed to suppliers etc. Equity is the number of shares owned by the company.